A raised platform – an altar – Ancient Vessel cradles a bowl. A hemisphere of burled maple represents a microcosm of the world. Undulating ocean waters and far-reaching mountain ridges can be found within the burl’s magic. An oak log split into opposing crescents and joined with a center-cut, creates an upward lift and focus, an altar. 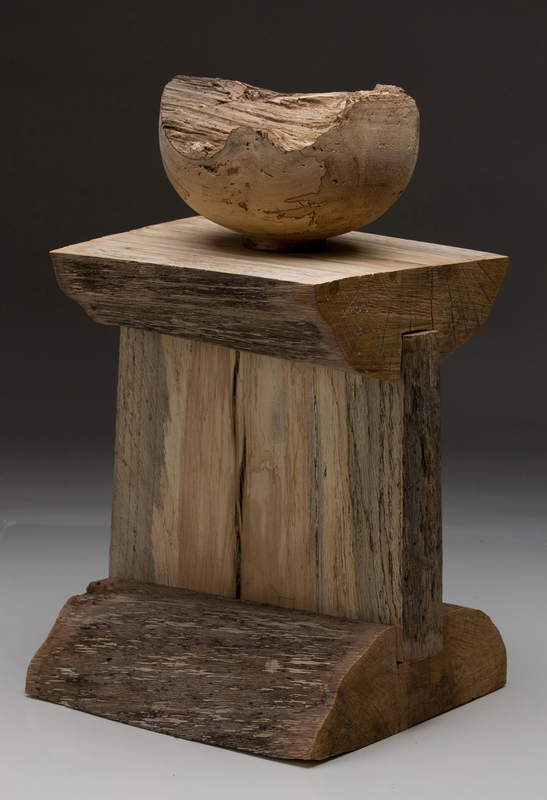 This piece uses rough exteriors and explores the rich hidden interiors of local harvested trees. Its form is a series of dichotomies: raw/refined, flat/round, straight/curved, horizontal/vertical and odd/even. A balance of spirit and structure, this pillar of strength echoes ceremonial tides. A chainsaw, lathe, planer and router, shape and reveal the intricacies of nature’s design interpreted by the artist’s hand. Inspired by the eloquence and the simple grace of line, movement and texture, this sculpture unveils an ethereal world created through the poetic imagination, an intuitive progression of the artist’s response to her chosen medium, trees.